The key to ensuring long-term effectiveness of your outbound telemarketing script may actually be to eliminate the “script.” Instead of writing paragraphs for agents to “read”, consider developing an outline or road map that provides directional conversation and key talking points to assist the agent in accomplishing their objective. Doing so, allows the agent to insert their personality, use their own words and build credibility with the prospect. Introduction – When making an outbound call, getting your “foot in the door” can be the biggest hurdle. Utilizing an effective call introduction is key – keep it short and sweet: Who are you? Why are you calling? And why should I listen? Transition Statements – Be mindful of your prospect’s time and be aware that your call likely interrupted their day. Use transition statements to set expectations and to maintain call control while moving from one phase of the conversation to the next. Discovery – Learning about your prospect’s needs is the key to winning their business. Take a minute to ask them a few simple questions to learn about what they’re doing today, what they like about it and what they don’t. Use combination of open and close-ended questions to ensure qualification and get your prospect talking so you can build rapport. Presentation – When presenting an offer, keep it concise. Clearly outline the key details of your proposal – and don’t forget to apply what you learned during the discovery phase of the conversation. Always tie your prospect’s needs back to a feature that provides benefit to the prospect. Verbalizing these value statements are the key to generating interest and buy-in. Assumptive Close – Be confident in your offering and “act as if”, If you’re setting an appointment, go ahead and ask what time of day works best for your prospect. Or if you’re selling a paid service, ask what method of payment they’d like to use to complete their order today. Until the prospect gives you a reason to believe they’re not interested, always assume a positive outcome. Confirmation/Recap – Take a moment to confirm your prospect’s contact info and ensure they understand their level of commitment, along with any action items they must take. Then set expectations for next steps. For example, when setting an appointment, let your prospect know that they’ll be getting an email confirmation; and schedule appointments within reasonable time frames to ensure follow-through. FAQs/Rebuttals – This is probably the most important component of any telemarketing script. Answering questions and overcoming objections is often the most difficult step for any telemarketing agent to master. Always remember that knowledge is power and arm your team with the necessary tools to complete their objective successfully. Anticipate common questions and objections and provide talking points to help agents over these hurdles. Compliance – Always make sure your telemarketing script includes any language that is legally required, like disclosing that you’re calling on a recorded line. Make this verbiage stand out so that it’s not easily overlooked. Also, carefully consider your wording to avoid sounding too rigid or official early in the conversation, as this can make prospects wary about the call. 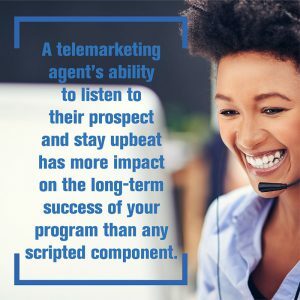 There are two additional components that are vital to the long-term effectiveness of your telemarketing script…a listening ear and a positive attitude. An agent’s ability to listen to their prospect and stay upbeat has more impact on the long-term success of your program than any scripted component. And let’s face it, in a job full of repetition and rejection, this is no small feat. So, work with other leaders on your team to connect the dots. Because these telemarketing script components, when combined with effective training, motivational leadership, and responsible quality assurance practices are sure make your program a success, now and in the future. Julie Kramme leads the sales team as Sales Executive for Quality Contact Solutions. Julie has a strong track record for building strong and lasting partnerships with each client she works with. With more than 20 years of call center and telemarketing industry experience, Julie is an expert in call center operations, regulatory compliance and technology. Julie leverages her deep experience to assist each client with creating customized solutions to meet their growth and customer engagement goals. Julie’s primary passion is achieving goals without sacrificing quality. She holds a Bachelor of Science in Management with a Marketing Minor from Upper Iowa University.